So, today I’m traveling. Not my favorite day as far as staying on my food plan, but usually the Minneapolis airport has some great selections. French Meadow Bakery, sushi, salads. But Nooooooooo…… Today, the security lines were long, so we went to the Skyway security checkpoint, which basically cost me my healthy lunch, as it bypassed said healthy options. Near the gate, we were confronted with three choices: hummus with pretzels (really? you can’t put a veggie in it? ), veggies, with dip (dip? yes, I’d like to eat healthy and serve it with a side of chemicals and fat), un-appetizing ham and cheese on bread, or the “Fresh Attractions” turkey pesto, roasted peppers and cheese on a brioche. Ok, I’ll take the turkey and remove the cheese. How bad could it be? My husband, who (full disclosure here) doesn’t need to watch his figure EVER, and I attempted to make this healthier. Step one. Remove cheese. Check. ( I would have done this anyway, we don’t eat dairy.) Step Two: He removes the part of the bun that has the mayo (He HATES mayo), so shamed into keeping up with him, I remove same half roll. He scrapes the mayo off the turkey. Takes a bite and basically says “Bleech”. Processed turkey with chemicals, processed low calorie mayo, a strip of red pepper crying out for a cousin, and that’s it. Welcome to mass produced American “convenience” food. And it’s killing us to be “convenient“. But, not having eaten, and our flight taking off almost an hour late, we need to eat. So, I figure I just ate at least 15 grams of fat. And not the good kind of fat. I can hope I removed more. And the carbs? Let’s see, what else is in this thing? 34 grams of Carbs, 1680 mg of Sodium (yep, 68% of your DAILY maximum amount), 47% of your cholesterol intake, and 6 grams sugar. And only 4% of your fiber. So, basically, if you eat this entire sandwich, it will hit your stomach, and without any fiber to slow it down, the 34 grams of carbs hit your bloodstream, and WHAMMO, you feel great, until your blood sugar tanks in an hour or two, and you can’t imagine why you’re starving! 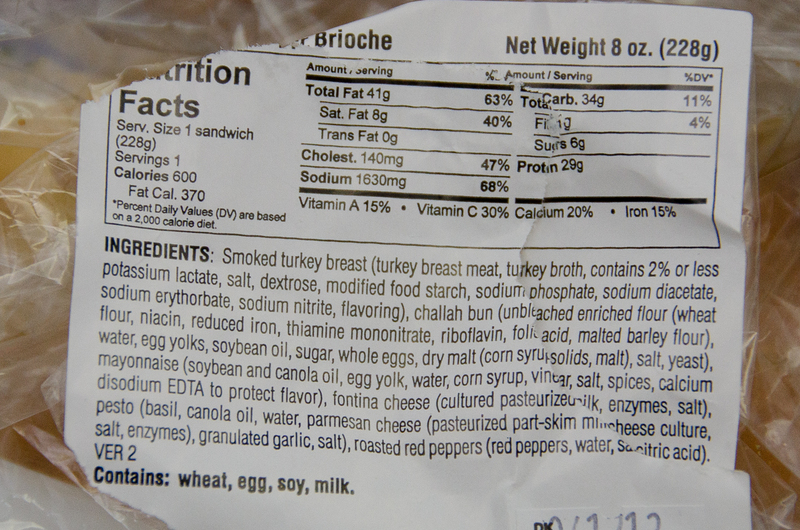 Turkey in this sandwich = turkey, turkey broth with potassium lactate, salt, dextrose, modified food starch, sodium phosphate, sodium diacetate, sodium erythorbate, sodium nitrite, flavoring. The Pesto, which we all know is pine nuts, basil, olive oil and parmesan didn’t have a pine nut in it. And the roasted peppers, which were miniscule, had some acid added to them. I won’t even go into the preservatives in the bun, you can see them in the photo. My husband suggested I re-name the sandwich. 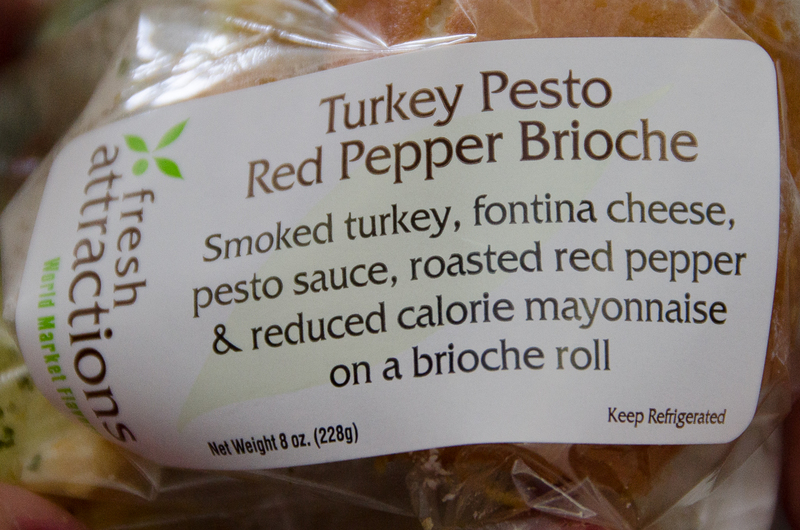 I think I’ll call it the Fresh Attractions “Not so Attractive 600 Calories on your Hips” Sandwich! What should I have stuck with? 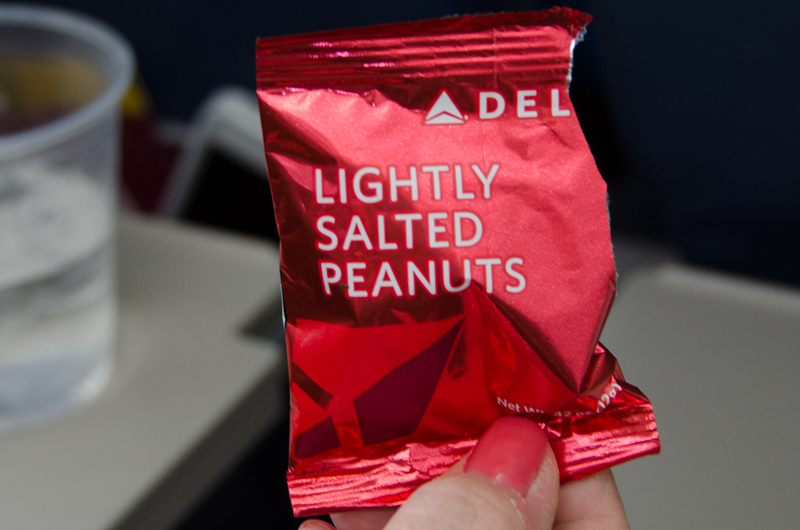 Probably Water and peanuts! Or my mini KIND bar in my backpack! Or get the hummus, toss the pretzels, get the veggies and dip, and ignore the dip. Yep, that would have been MUCH better… I think! Next time I better check what’s really in the hummus. Oh well, at least I have a gym at our hotel! So, the lesson here is READ YOUR LABELS!!! And consider bringing food that you’ve made yourself. It does check through TSA. All you have to do is let them inspect it. (No, you cannot bring liquid, the fluid rules still apply). Next time I will bring my own healthy lunch. I am worth it! 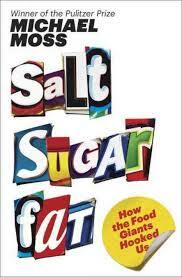 I will also strongly suggest (again) you read the NY Times bestseller “Salt, Sugar, Fat” by Michael Moss. It is a fascinating look at the convenience food industry. A must read for anyone who wants to stay healthy. It explains how all these chemicals ended up in our food. All in the name of convenience. It is NOT convenient to go to the hospital and have a coronary bypass! Have an awesome weekend everyone. And watch out for the chemicals. At first I thought, what’s wrong with the ingredients on the label, esp. the “reduced calorie mayonnaise”? Until I saw the REAL ingredients on the back. Eww! Exactly what happened to me! Thanks! The label makes it sound SOOO healthy!